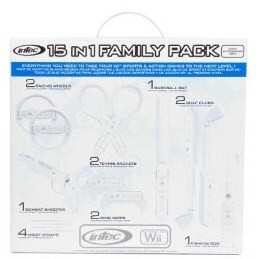 Wii 15-in-1 Family Pack: $7.86 + Eligible for Free Shipping! All Your Gaming Needs Taken Care Of! HURRY over to Amazon and score a Wii 15-in-1 family pack for only $7.86! This regularly costs $29.99 and ships for free on your order of $25 or more! This costs $14.70 at Walmart. This set has just about every game accessory your family could need to play the many different Wii games!